author (Bull. : Fr.) Fr. english name "European Solitary Lepidella"
2. 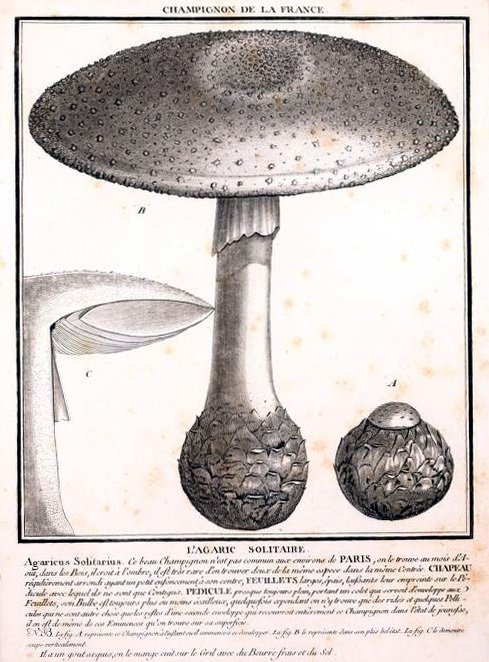 Amanita solitaria, lectotype from Bulliard's Herbier de la France. 3. Amanita solitaria, Čelákovice, Czech Republic. 4. Amanita solitaria, Čelákovice, Czech Republic. 5. Amanita solitaria, Čelákovice, Czech Republic. 6. Amanita solitaria, Čelákovice, Czech Republic. cap The cap of A. solitaria is (50-) 70 - 160 (-200) mm wide, globose at first, convex with expanding, soon plano-convex to flat with a slightly depressed center, dry to subviscid, with a nonsulcate, projecting, slightly appendiculate margin. The cap is dingy white to dingy cream to pale silvery gray to pale brownish gray especially near the center, with age sometimes becoming pale brownish straw yellow. The surface texture at the center can be subfelted and minutely fibrillose at the margin, later becoming smooth. The cap is usually decorated with small, whitish to concolorous to slightly darker gray, acute-conical to low conical, subfibrillose, adnate to subdetersile warts sometimes having what appears to be bits of spiderweb at the base. gills The gills are rather crowded, narrowly adnate to just free, broad, ventricose, and greenish cream-yellow. The short gills are subtruncate to more or less attenuate. stem The stem is (60-) 100 - 140 (-200) × (10-) 15 - 25 (-30) mm, rarely subcylindrical, pointed to rounded, solid, whitish to pale straw yellow, and annulate. The membranous, persistent annulus can be double as in A. cokeri (E.-J. Gilbert & Kühner) E.-J. Gilbert. 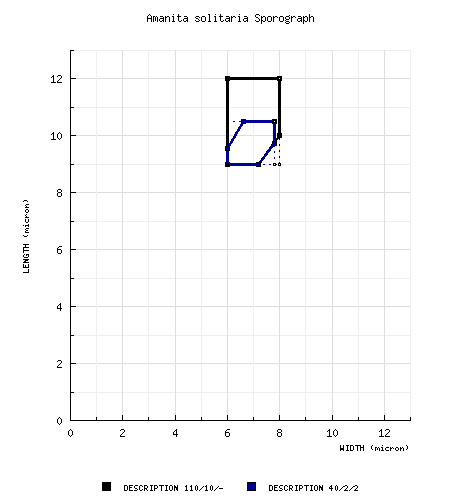 spores The spores measure 9.0 - 12.0 (-14.5) × 6.0 - 8.0 (-11.5) µm and are amyloid and broadly ellipsoid to elongate. Clamps are present at bases of basidia. discussion This species is to be found in Europe, Western Asia, and Mediterranean Africa. According to Borovička (2006), the species often occurs co-located with A. strobiliformis (Paul. ex. Vitt.) Bertillon in association with Tilia in the Czech Republic. For a set of closely related taxa for comparison (species of Bas' stirps Solitaria), see A. cokeri. The most recent in-depth revision of A. solitaria is by Neville and Poumarat (1996). ≡Agaricus solitarius Bull. 1780-1781. Herb. France 1: pl. 48. ≡Agaricus solitarius Bull. : Fr. 1821. Syst. Mycol. 1: 17. ≡Venenarius solitarius (Bull. : Fr.) Murrill. 1912. Mycologia 4: 240. ≡Aspidella solitaria (Bull. : Fr.) E.-J. Gilbert. 1940. Iconogr. Mycol. (Milan) 27, suppl. 1 (1): 79, tab. 58 (figs. 3-5). ≡Agaricus procerus Scop. 1772. Fl. Carniola 2: 418. ≡Agaricus procerus Scop. : Fr. 1821. Syst. Mycol. 1: 20. 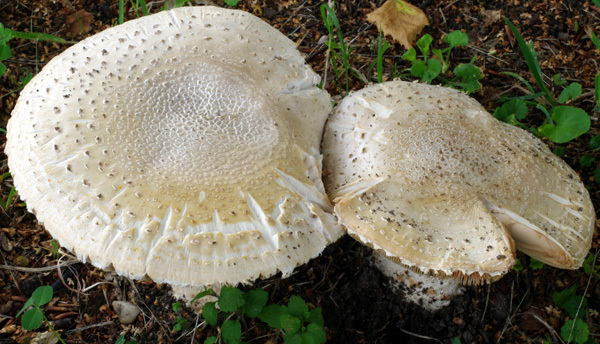 ≡Lepiota procera (Scop. : Fr.) P. Kumm. 1871. Führer Pilzk. : 135. ≡Lepiotophyllum procerum (Scop. : Fr.) Locq. 1942. Bull. Mens. Soc. Linn. Lyon 11: 40. ≡Macrolepiota procera (Scop. : Fr.) Singer. 1946. Papers Mich. Acad. Sci. Arts Letters 32: 141. =Agaricus aculeatus Vitt. 1832. Descr. Funghi Manger. : 62.
non Agaricus aculeatus Vitt. 1835. Descr. Funghi Manger. : 348. =Amanita strobiliformis var. aculeata Quél. 1886. Enchir. Fung. : 3. ≡Amanita strobiliformis subsp. aculeata (Quél.) Sacc. 1887. Syll. Fung. 5: 15. ≡Amanita aculeata (Quél.) Bigeard & Guill. 1913. Fl. Champ. Supér. 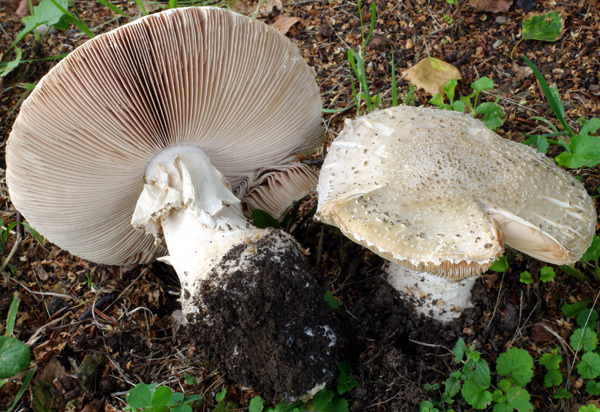 France: 44.
non Agaricus aculeatus Vitt. 1832. Descr. Funghi Manger. : 62. ≡Amanita echinocephala (Vitt.) Quél. 1872. Mém. Soc. Emul. Montbéliard 2(5): 321. 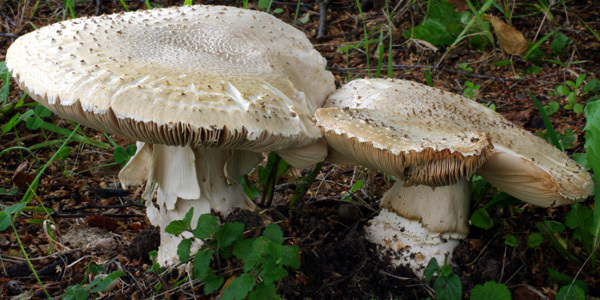 ≡Lepiota echinocephala (Vitt.) Gillet. 1874. Champ. (Hyménomyc.) Croiss. France: 69. ≡Lepidella echinocephala (Vitt.) E.-J. Gilbert. 1925. Bull. Trimestriel Soc. Mycol. France 41: 304. ≡Aspidella echinocephala (Vitt.) E.-J. Gilbert. 1940. Iconogr. Mycol. (Milan) 27, suppl. 1 (1): 79. ≡Armillaria echinocephala (Vitt.) Locq. 1952. Bull. Trimestriel Soc. Mycol. France 68: 167. ≡Amanita umbella var. echinocephala (Vitt.) Quél. 1886. Ench. Fung. : 4. ≡Amanita vittadinii var. echinocephala (Vitt.) Veselý. 1933. Ann. Mycol. 31(4): 285. ≡Fungus tricuspidatus Paulet nom. inval. 1793. Trait. Champ. Comest. 2: index . 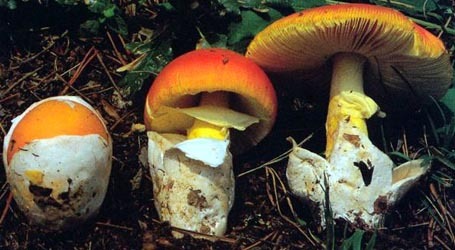 =Amanita echinocephala var. bicollariata Boud. 1904. Iconogr. Mycol. 3(11): pl. 298. ≡Amanita umbella var. echinocephala f. bicollariata (Boud.) E.-J. Gilbert. 1918. Gen. Amanita Pers. : 101. ≡Lepidella echinocephala f. bicollariata (Boud.) Konrad & Maubl. 1926. Icon. Select. Fung. 1(2): 38??. ≡Amanita solitaria subf. bicollariata (Boud.) Neville & Poumarat. 1996. Doc. Mycol. 26(101): 68.
? ?=Amanita flandinia Plée. 1844-64. Types Fam. Genres Pl. France 2:(57): , pl. 12. MK277567 nrLSU 23.vii.2009 Josef Kadeřávek s.n. [Borovička BORE 40] (RET 455-3) L. Nagy, Agaricales Diversification, Szeged Univ. 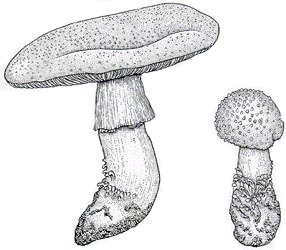 lectotypes Agaricus solitarius & Amanita procera—Bulliard. 1780. Herb. France: pl. 48. Fungus tricuspidatus & Amanita echinocephala—Paulet. 1812-1835. Iconogr. Champ. : pl. 163 (fig. 3). Amanita strobiliformis var. aculeata—Quélet. 1872. Mém. Soc. Emul. Montbéliard II 5: pl. 1, fig. 1.
lectotypifications Agaricus solitarius, Agaricus echinocephalus, Amanita procera, Fungus tricuspidatus, & Amanita strobiliformis var. aculeata—Bas. 1969. Persoonia 5: 394.
revisions Bas. 1969. Persoonia 5: 394, figs. 102-106. Neville and Poumarat. 1996 Doc. Mycol. 26(101): 42.
selected illustrations Neville and Poumarat. 1995. Bull. Semestriel Féd. Assoc. Mycol. Médit. 7-8: figs. 6-8. The following material is derived from the revision of Bas (1969). Bas (1969): Basidiomes medium to very large. pileus Bas (1969): (50-) 70 - 160 (-200) mm wide, sordid white to sordid cream to pale silvery gray to pale brownish gray especially toward center (sometimes with slightly greenish tinge), with age sometimes becoming pale brownish straw yellow, globose at first, convex when expanding, soon plano-convex to planar with slightly depressed disc, having subfelted appearance over disc to minutely fibrillose toward margin, becoming smooth in age, dry to subviscid; context rather firm, white except cream just below pileipellis; margin nonstriate, slightly appendiculate in young material, projecting; universal veil usually as small warts, 0.5 to 3 mm high, whitish to concolorous with pileus surface or slightly darker gray, acute-conic to low conic, subfibrillose, adnate to subdetersile, sometimes becoming small scattered flocculent fragments toward margin or completely washed away by rains. lamellae Bas (1969): narrowly adnate to barely free, sometimes with decurrent lines at top of stem, rather crowded, greenish cream-yellow (Séquy 220) in side view, with age becoming brownish straw yello, up to about 15 mm broad, ventricose, with whitish minutely granular edge; lamellulae subtruncate to more or less attenuate, often with proximal part of edge very irregular. stipe Bas (1969): (60-) 100 - 140 (-200) × (10-) 15 - 25 (-30) mm, whitish to pale straw yellow, darker yellow spots at base, usually narrowing upward, sometimes subcylindric, longitudinally sulcate-striate above partial veil, appressed fibrillose to fibrillose-subsquamulose below; bulb clavate to clavate-fusiform to fusiform to napiform, pointed to rounded, up to 60 × 40 mm, often with more or less concentric rows of scales (ascending. appressed or recurved, rather thick, up to 3 mm wide) on upper part, sometimes simply squamulose; context solid, white, rather firm; partial veil pendent, subfelted-membranous, apical to subapical, up to 25 mm broad, white when young, straw yellow with age, striate above, fibrillose to cottony with with thick warts along the edge below; universal veil [probably to be found on tips of scales on bulb—ed.]. odor/taste Bas (1969): Odor "moderately strong, unpleasant, subraphanoid with chemical component." Taste indistinct. pileipellis Bas (1969): not or slightly gelatinized near surface; filamentous hyphae 2 - 8 μm wide, interwoven to subradially arranged, colorless to pale brown. lamella trama Bas (1969): bilateral[, divergent], without terminal inflated cells. subhymenium Bas (1969): ramose or with irregularly inflated cells. basidia Bas (1969): 40 - 60 × 11 - 13 μm, usually 4-sterigmate, sometimes 1-, 2-, or 3-sterigmate; clamps present. universal veil Bas (1969): On pileus: with elements more or less anticlinally arranged, dingy yellowish to pale yellow-brown in alkaline solution, sometimes with distinct brownish intracellular pigment; filamentous hyphae parallel, rare to rather abundant, most abundant in base of warts; inflated cells abundant, in parallel chains, mainly ellipsoid to clavate (most abundant in tops of warts), also subglobose or elongate or irregular, up to 110 × 60 μm; vascular hyphae scattered to rather abundant. stipe context Bas (1969): longitudinally acrophysalidic; filamentous hyphae 2 - 10 μm wide, yellowish to deep golden yellow in alkaline solution; acrophysalides abundant, up to 400 × 60 μm; vascular hyphae scattered to abundant. lamella edge tissue Bas (1969): filamentous hyphae 4 - 12 μm wide; inflated cells in tufts, slenderly to broadly clavate, pyriform, or irregularly shaped. Bas (1969): [110/10/-] 9.0 - 12.0 (-14.5) × 6.0 - 8.0 (-11.5) μm, (Q = 1.25 - 2.0; Q = 1.30 - 1.75), hyaline, colorless, thin-walled, amyloid, ellipsoid to elongate, infrequently broadly ellipsoid, infrequently cylindric; apiculus not described; contents subgranular, somewhat refractive; white to cream with greenish tint in deposit when fresh, dingy cream without greenish tint when dry (slightly more cream yellow than 5Y 8/4). composite of all material revised by CRC: [40/2/2] (8.5-) 9.0 - 10.5 (-11.0) × (5.0-) 6.0 - 7.8 (-8.0) μm, (L = 9.9 μm; L' = 9.9 μm; W = 6.7 - 7.4 μm; W' = 7.1 μm; Q = 1.25 - 1.59 (-1.73); Q = 1.33 - 1.48; Q' = 1.40), ? ?, amyloid, ellipsoid to elongate, infrequently broadly ellipsoid, adaxially flattened; apiculus ?? ; contents granular and/or mono- to (infrequently) multi-guttulate; color in deposit not recorded. ecology Bas (1969): Solitary to gregarious. 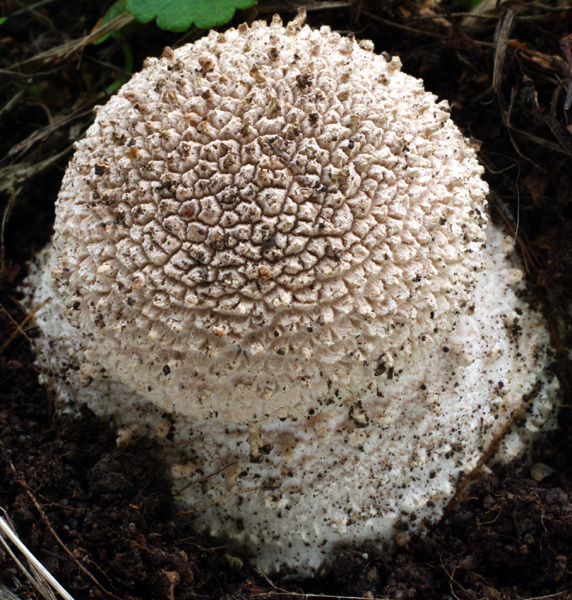 Terrestrial in woods on heavy calcareous or neutral soils in Europe, except the northern part, with preference for alluvial soils, fruiting especially in warm, dry summers. Czech Republic: In a garden near Betula, Fagus, Picea, and Tilia. Switzerland: At 450- - 500+ m. Under Picea, Abies, and Fagus or under Fagus and Picea. material examined Bas (1969): AUSTRIA: Ca. Vienna, s.d. Hagenbrünn s.n. (PR). CROATIA: Dalmatian Islands, Isl. Ugljan, 25.xi.1964 M. Tortič s.n. (fragments in L). CZECH REPUBLIC: CENTRAL BOHEMIAN REGION—Karlštejn, 5.ix.1952 S. Indelka s.n. (PR). ÚSTÍ NAD LABEM REGION—Libochovice nad Ohři, 19.ix.1961 Z. Neubauer s.n. (PR). FRANCE: OISE—Orry-la-Ville, viii.1949 H. Romagnesi s.n. (S). PYRÉNÉES ORIENTALES—ca. Perpignan, 11.xi.1966 A. Marchand s.n. (L). ITALY: TRENTO—Vela, NW of Trento, vi.1901 G. Bresadola s.n. (S). TUSCANY—Isl. Elba - Porteferraio, x.1913 Gabari s.n. (S). NETHERLANDS: UTRECHT—Utrecht, 31.viii.1953 C. Bas 150 (L), 18.ix.1953 C. Bas 206 (L); Zeist, 17.ix.1953 O. F. Uffelie et al. (in herb. Uffelie). SLOVAKIA: Saudorf ca. Bratislava, 12.ix.1948 F. Drascla s.n. (PR). U.K.: ENGLAND—Surrey - Horseley, 6.ix.1953 R. W. G. Dennis s.n. (L). Zhang et al. (2004) voucher for sequencing: GERMANY: UNKN. STATE—unkn. loc., s.d. unkn. coll. s.n. (HKAS 31459). RET: CZECH REPUBLIC: CENTRAL BOHEMIAN REGION—Čelákovice, 23.vii.2009 Josef Kadeřávek s.n. [Borovička BORE 40] (PRM 915810; RET 455-3). FRANCE: GIRONDE—Madirac, 29.viii.1999 Francis Massart 99023 (in herb. F. Massart; RET 298-1). SWITZERLAND: ZÜRICH—Zürich, 25.viii.1991 Carmine Lavorato 910825--- (in herb. C. Lavorato; RET 033-5), 20.x.1991 C. Lavorato 910927-23 (in herb. C. Lavorato; RET 036-5), 10.ix.1992 C. Lavorato 920910-02 (in herb. C. Lavorato; RET 079-3). photo Dr. Jan Borovička - (3-6) Čelákovice, the Czech Republic. historic plates Bulliard - (2) plate 48 from Herbier de la France. drawing Dr. Cornelis Bas (1969) - (1) Europe, reproduced by courtesy of Persoonia, Leiden, the Netherlands. provisionally identified as: Amanita solitaria (Bull. : Fr.) Fr.